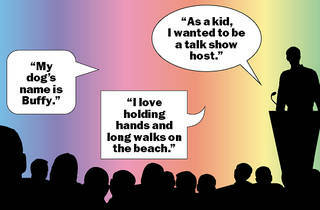 A new dating event connects singles via PowerPoint. I feel as if I can hear a pin drop when I prattle on about my nerdy obsessions including my pets, the Golden State, a song that changed my life (“A Rush a Push and the Land Is Ours” by the Smiths) and the political blog FiveThirtyEight.com. But when I mention that my best pickup line ever is, “I’m exploring the world from top to bottom,” the crowd of men and women breaks into laughter. Thank God. 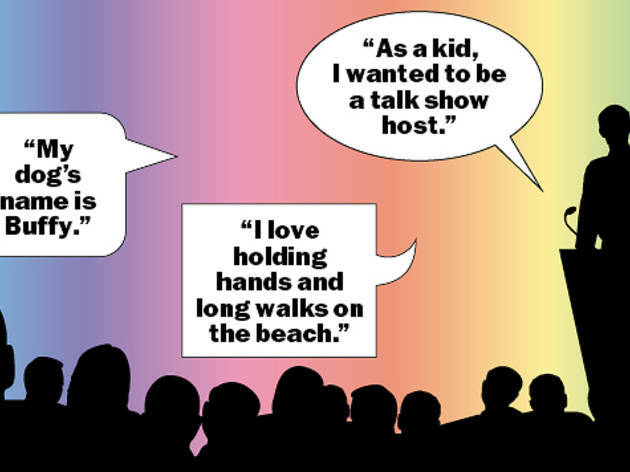 I’m delivering a presentation via PowerPoint at Me So Far, an experiential Chicago dating event in which “talkers” deliver slide presentations about their quirkiest and most revealing selves to a crowded room full of “listeners,” who are also single and eager to make a love connection. The next event, “Just for the Fellas,” happens Wednesday 24 at Sushi Taiyo. Me So Far is the brainchild of Lakshmi Rengarajan, a strategic planner at Draftfcb who launched the concept in 2010 as a way to connect singles outside of the bar scene. The ongoing series (mostly aimed at heteros) targets niche audiences; there’s nerd night, for example, and an event for adults over 40. Wildly curious (and also single), I participated in an event in May aimed at both gay men and lesbians. There are two kinds of attendees at Me So Far: “talkers” and “listeners.” Talking means you deliver a five-minute presentation about yourself (there’s a bell to remind you if you’re going over your limit) based on an exhaustive set of questions designed to reveal personal information that wouldn’t come up in everyday conversation. A few that the “talker” can choose from: In what situations do you shine; describe one of your childhood dreams; share a time when you felt as if you failed and list a friendship you lost along the way. Rengarajan encourages participants to delve deep. At my Me So Far event, there are ten “talkers” roughly split between men and women of various ages. The “listeners” are starting to arrive, and we are encouraged to mingle with them beforehand at the bar at the Den Theatre, where the event is being held. I’m very nervous, but Rengarajan anticipates this. The theater is candlelit to add ambience and so that when we present, we can’t see the audience in front of us. However, the first “talker,” a confident lesbian of Southern origins, absolutely kills it. I’m certain she’ll garner a few romantic connections based on her presentation. I, on the other hand, stumble through a tense four minutes with shaky hands and buttery legs and judge my performance as just all right. But a cool thing happens: At the social hour afterward where “talkers” and “listeners” mix, we presenters are greeted like rock stars. I find myself entering into conversations not just with single men but also women whose curiosity was piqued by my presentation. This is by far the best part of the night as I find myself connecting with all kinds of guys (including a couple cute ones). All “talkers” are given temporary e-mail accounts (an expiration date is designed to ratchet up the pressure), and to my surprise, I do make a connection with a lovely gent named Steve. Our date the following week includes generous helpings of frozen yogurt and a stroll through Lakeview on a balmy spring night. Rengarajan speaks of the “Me So Far effect” as a recharging that both “talkers” and “listeners” bring to dating long after they’ve attended an event. There’s some truth to this, although my dating life isn’t all that different months later. Regardless, I would do this again. Me So Far’s “Just for the Fellas” happens Wednesday 24. See mesofar.net.